This blog is about living in Chennai (India) as an expat. Wow. What a change in just 2 years of absence. So, after 2 years of not being in Chennai we decided to spend some holidays in the city, which we loved to live in for 3 years from 2005 - 2008. Now with all the good memories in our luggage and certainly all the bad ones somewhere lost in the past 2 years we were all geared up to enjoy a good 2 weeks of holidays with friends and former business partners. I really took us as a surprise of how much the city has changed. New roads, fly overs, buildings, shops coming up at least in the happening places of the town such as on and around OMR. Great to see as well, that all my former employees are better off, then they used to be, climbing steep on the career leathers and just being able to afford Western-standard lives with apartments, cars, great education for their kids and holidays abroad. Seems the economic crisis has not really hit at least the middle management in the Indian economy. One of my most favorite topics on infrastructure has always been airports. 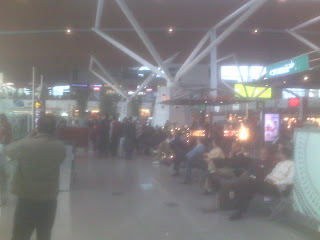 The new Delhi airport actually blew me away. What used to be comparable to a worse off London tube station has developed into a world-class airport with all facilities you need to have on the gateway into the country and the world. We came back with great pride, that the country is just doing so amazingly and we have been able to contribute with a drop in the ocean a few years back and one thing is for sure: WE WILL BE BACK, because we really love the place! If you leave for good the country as we will on Saturday, the exit visa procedure has to be followed. There is not too many documents, which have to be collected the only interesting thing again is, that nobody really knows what is required. Let me therefore summarize here, what is required to exit India from a legally acceptable perspective. First of all a Non Objection Certificate from the Tax Authorities is required, which states that you have been a good tax payer in India. With this NOC plus a letter from your employer, that your time is over, you need to go for an appointment to the Foreign Registration Office (FRRO) with these documents plus your passport. Once there they will tell you, that they will send a letter to the airport authorities anticipating, that you leave the country. At the time the last exit on the basis of the residence permit you have to just hand over your residence permit to the officer at the immigration counter. This piece of information we still have to verify, because it will only happen next week, but I am sure, they let us go one way or another. I have started to create a map with places of interest for expats. You find places on the map with shopping, restaurants, food shopping, party places, pubs, beaches, hospital and all other ammenities expats need in the town of Chennai. If you want to contribute with places drop me a mail.